1. Obviously, everyone knows much more than any one person does. 2. However, some of the best decisions are made by individuals. 3. That said, the more reliable and relevant the available information is, the better the decision is likely to be, whether made by an individual or by a group. 4. The most difficult decisions tend to be made amidst a crisis; in an ER, for example, or during a battle. A leader must often make a decision without hesitation or benefit of consultation with others. 5. I hasten to add that, although that decision will not be based on collective judgment, it will be based on collective experience. 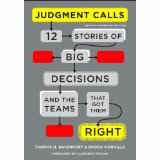 Here’s a direct link to my review of Judgment Calls.